The deep impact of good ad copy and the ad testing process. Ad copy testing lies at the heart of a successful AdWords account. Here's why. Testing ads is one of the activities that is the most undervalued by AdWords advertisers. A better ad will get you a better ad rank, which in turn with improve your eligibility (the portion of time Google decides to put your ad in an auction), your ad position (which could be the difference between 15% CTR and 1.5% CTR) and how much you actually pay per click (effective CPC). But writing a good ad isn't just about improving quality score to lower costs. It also frames the user's mindset before they visit your landing page. In other words, your ad copy impacts your conversion rate (whatever your conversion might be - a sale, an email opt-in, a phone call...) Different ad copy will attract different people at different stages of the conversion cycle. For example, the word "free" in your ad copy with notoriously improve your CTR, but will decrease your CR% (conversion rate). This is because you'd be attracting more freebie seekers. So ad testing is a magic cure-all elixir that will fix all of your problems. Conversions low? Write better ads. Volume of clicks low? Write better ads. CPC too high? Write better ads. Run out of toothpaste and all the shops are closed? Write better ads. Here's some background and context on how to play Google's game. These are Google's main 3 stakeholders. The main players if you will. Advertisers pay Google to run ads to searchers. Google needs to make money. Searchers need to find what they're looking for and advertisers need to reach searchers at a reasonable price. It's a fine balance, and you can't skew it too much in somebody's favour. Google can't be too lenient to advertisers because then quality of landing pages, ads etc. suffers meaning user experience will suffer meaning Google's darkest nightmare will become true - users will go to bing! But they have to keep the advertisers happy because their profit and loss statement depends on it. The genius of Google is integrating this dynamic into the economics of AdWords to incentivise the desired outcome - keeping all stakeholders happy. By creating quality score, Google incentivises advertisers to contribute to a positive user experience (via great ads and a relevant landing page) by rewarding them with lower costs and more exposure - a marketer's dream. Lets take a look at the details of how Google does this and how you can play its game for fun and profit. In short, how good an advertiser you are multiplied by how much you're willing to pay per click determines your general power on the marketplace - called AdRank. This means that if you want to pay less per click, you need better quality. And vice-versa, if you have poor quality, you're forced to compensate by paying more per click. First, we need to translate Quality Scores into an understanding of strength. 1/10 - Epic Fail - If you're scoring a 1/10, you're in trouble. Google has or is about to ban your website. You'll hardly get any traffic and your costs will be stupid high. 2-3/10 - Sick - At 2/10 and 3/10, your keywords are suffering bad. You're getting a fraction of the traffic you could and you'll be charged very high prices to compensate for such bad QS. To go from 2 or 3 to 7/10 will require some work. 7/10 - Good - You've accomplished what you needed in terms of quality. Google likes what you're doing and you're not being penalized in terms of traffic or costs. You should be happy with a 7/10, because the jump from 7/10 to anything above sometimes doesn't make sense. Keywords often go from 7/10 immediately to 10/10 with no transition to 8 and 9. Focus on QS < 7 instead of trying to get a 7 to a 10. 8-10/10 - Excellent - The holy grail. At this point, you've surpassed Google's expectations and your performance is above average. Your costs are being discounted and your ads are appearing in prominent positions and more frequently. The dream! Now lets look at what actually influences your Quality Score - what you can do about this. Above is a rough estimation of what goes into determining your quality score for a keyword (Google keeps its top secret sauce for itself). 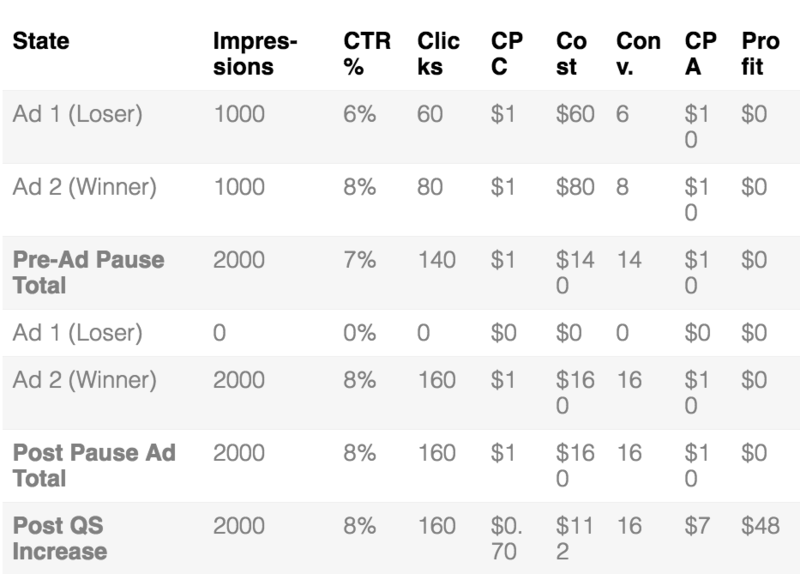 As you can observe, most of quality score is determined by your CTR for a keyword. Note that this is relative to your average position. Seeing as CTR decreases as your average position on the SERP decreases, you are being judged on your CTR relative to your ad position. 5% might be a fantastic CTR for position 3, but might be weak for position 1. It's worth noting that Landing Page is more of a pass or fail test than it is a scale. This means that it can mostly only hurt you. If your quality score is 4 or below, you probably have a landing page problem. Above that, optimizing your landing page for quality score is probably a waste of your time (although you should do it anyways for conversion rates!) If quality score is what you're after, you should focus on relevancy and CTR instead. Read our article on how to build landing pages for better quality score. Also check out our case study on Navion Insurance for a detailed process on how to create strong PPC landing pages. These two should give you a great start, and you shouldn't ever be confused on how to create strong AdWords landing pages again. The short version of this is you should always have at least 2 ads running in an adgroup and as soon as you have statistical significance on one ad being inferior to another (using either the PPI, CPA or simple but trusty CTR metric), you should pause the losing variant. This way, you are aggressively testing ad creatives, boosting your CTR, and thus your Quality Score which as we've seen has a miraculous impact on your AdWords account performance. Pausing an inferior ad will direct more traffic to the superior ad in the adgroup. 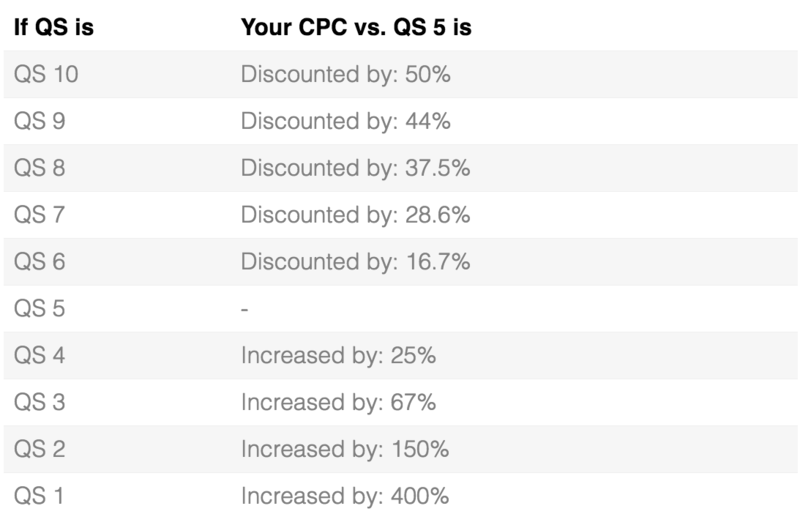 If both ads have the same conversion rate, this won't directly impact the adgroup's performance, but often you'll experience a QS boost which will result in lower CPCs and more traffic for the same budget which will boost your profitability. Here's a simulation below assuming a conversion is worth $10. Writing a great ad starts with investing your time into understanding your audience. This is more general research which is worth doing regardless if you haven't done it already. 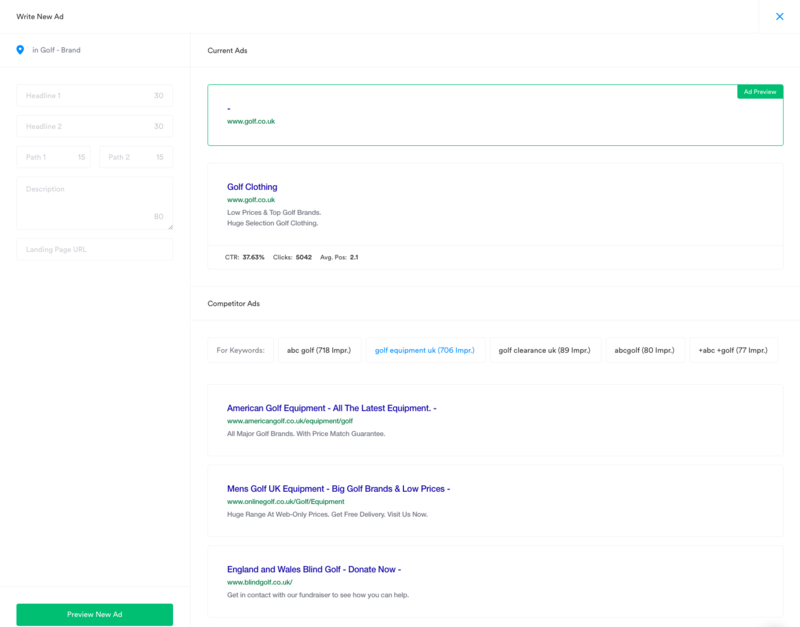 Not only will it help you write better AdWords ads, but it will also help you write better Landing Pages, better emails, as well as any other marketing material you're working with right now. Demographics are a good place to start. Use AdWords' Display Planner to dig into the demographics of your searchers. In the example above, we're marketing to a demographic that's mostly male, 65+ and who have no kids. How would this influence your ad writing? For psychographics (defined as the classification of people according to their attitudes, aspirations, and other psychological criteria) Amazon Reviews for products in your market are a great place to start. I like to look at the extremes - the 1-star and the 5-star reviews. Assuming we're writing an ad about Puppy Food, here's a few examples of what I found on Amazon Reviews and how this process can be useful. "No artifical additives" that could be helpful. Interesting, forgot that people who have puppies might be closer to the country - we could roll with something like "delivered strait to your doorstep". Convenience of opening the packaging... Interesting. "Easy-Open Pouches!" could go into our ads. "Spying" on forums and boards (or lurking as it's called) is another great way to get a feel for customer psychographics. If you want to take it further, the ultimate tool is live interviews. This strategy will give you the more customer insights than any other. When you get to speak to someone on the phone or in person about them and their previous problems (and how they overcame those problems) you'll get to discover stuff that just can't be found on public websites. Interview someone you know that has experienced the pain (and the need for a solution). Find someone asking for help on forums. Find someone who's (finally) experienced relief from the "problem" on forums. Post an ad on Craigslist asking for interviewees to come forward for money. Now you can take all this research and compile it into a persona, an avatar. Who will be searching for your keywords? You need to figure out (specifically) what it is that they want to achieve (the desired end result from their perspective). What is their WHY? If you can get into their emotions, their pains and gains, you'll be able to write much more compelling ads. Make sure you build an avatar using facts collected through real research, not just "made-up" guesswork sitting at your office desk! Another way to compile this data is through an emapathy map. An Empathy Map is a map of someone else's point-of-view. It's what they see, say, think, feel and hear. Their perspective, their world view, their emotions and beliefs. You can download an empathy map template here. Towards gain vs. away from pain is a very common approach to explore. Another one is focusing on your (the advertiser) or on the searcher. This alone can help you brainstorm 4 variants per benefit you're trying to convey. For example, lets say we wanted to convey the healthiness benefit of our puppy food. If you're new to all this, make sure you use the keyword in the headline of the ad. This usually just strait up works, and is better than anything cutesy. Numbers and ASCII characters make the ads stand out from the competition and draw more eyeballs to it than a block of words/letters. Here's and example with lots of numbers, some ASCII characters a credibility angle and a call to action. SemRush, SpyFu, KeywordSpy, iSpionage can all help you find examples of competitor ads. If it's an important ad group, go all the way to the Landing Page to check out what the competition is accentuating. It may give you ideas for your ad angles. Of course, we take it a step further and pull ads from these services to prefill to speed up the process further. Once you gather competitor ads for a keyword, you can then put them into a "matrix" (makes you sound cool, really it's just a table). Now we can take any combination of the above to craft a "Best Of" of our competition. Healthiness - There's lots of creative ways we could use the healthy angle:"Real meat and veggies your puppy will love! ", "Help your little guy grow up healthy! ", "Our all-natural ingredients...", "everything your puppy needs! ", "Give Your Puppy The Nutrition They Need Today. ", "100% Complete & Balanced", "100% Of What Pups Need, 0% Of What They Don't", "Food Made To Help Your Puppy's Development", "Nutrient-Packed Ingredients"
Appeal to Puppy-Owner Love - "Serve Your Dog Irresistible Cuisine", "Give Your Buddy A Delightful Combination Of Flavors & Textures", "Love your puppy back with our..."
Convenience - "Right to your door", "Fast, free delivery", "Leading brands delivered direct", "One stop shop for Puppy food"
Affordability - "As low as Â£13.99", "4 Case Deal from Â£59.99 Delivered", "Massive Savings On Puppy Food"
Credibility - "#1 customer rated puppy food", "Puppy owners' trusted choice", "1st choice of puppy owners in the UK", "Recommended by top vetinarians"
Informational & Curiosity - "What should you feed your puppy? 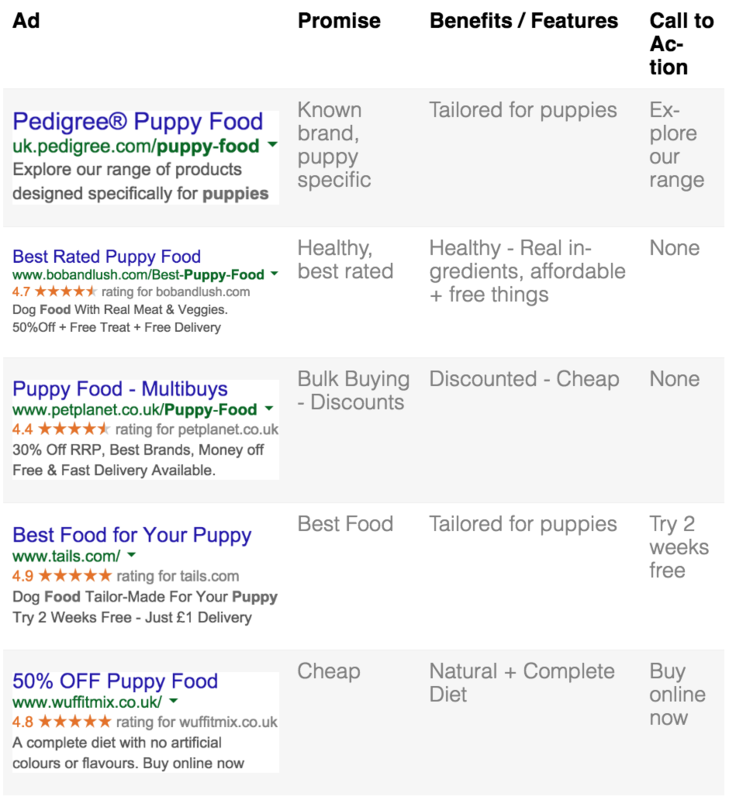 ", "How to Choose the Best Food For Your Puppy"
Hopefully now you understand how a little bit of market research can help you write compelling, powerful ads! Mix this art with some science via the Ad Testing process we saw earlier and go crush your competition!